The Rockies announced that they have agreed to a minor league contract with first baseman Ryan Howard. This is the second time this year the longtime Phillie has taken a minors pact. 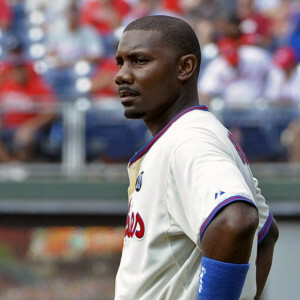 Howard signed one with the Braves back in April, but the 37-year-old only lasted about a month with the organization. After Howard batted just .184/.238/.263 in 42 plate appearances with the Braves’ Triple-A affiliate, they released him. At his best, Howard was an NL MVP-winning slugger in Philadelphia, where he belted 382 home runs from 2004-16 and swatted between 31 and 58 HRs in each season from 2006-11. But Howard declined markedly as his Phillies career progressed and posted a personal-worst season in 2016, making it difficult for him to find work since. Howard still possesses enough power to make him a somewhat interesting fit for Colorado’s Coors Field, but he’s certainly not a lock to ever play a game for the Rockies. The playoff hopefuls have gotten solid production at first this year from Mark Reynolds, and they just promoted big-hitting prospect Ryan McMahon on Friday. Nevertheless, with Sept. 1 roster expansion forthcoming, Howard will hope to make his way back to the majors during the season’s final weeks. The pursuit of Shohei Otani could be unlike anything we’ve ever seen, but it won’t begin in earnest for some time. Given the stakes, though, teams have already begun jockeying. The Rangers, in particular, sent a contingent led by GM Jon Daniels to watch Otani work out, as Even Grant of the Dallas Morning News reports. Though the 22-year-old phenom isn’t even able to pitch right now, sending over the top baseball ops brass was presumably conceived of as a means of laying some groundwork and working to get on Ohtani’s radar. Texas is a particularly interesting potential suitor, given that the team has employed star Japanese hurler Yu Darvish — and that he’ll be a free agent at season’s end. Veteran slugger Ryan Howard isn’t planning to retire, Meghan Montemurro of the News Journal reports. While the 37-year-old did not last long with the Braves organization after signing recently, he says he still has designs on playing. “By no means am I done,” Howard said. Nevertheless, the former National League MVP has also turned some attention to the future; he has become a partner with a venture capital firm called SeventySix Capital. While things have been far from perfect in the Reds pitching staff, the current roster represents a major upgrade in at least one way, as Zach Buchanan of the Cincinnati Enquirer writes. Despite needing to rotate through some arms, the club has only needed to clear a 40-man spot on one occasion, owing to the presence of more optionable players. Derrick Goold of the St. Louis Post-Dispatch takes a look at the potential impact of the return of reliever Seth Maness, the former Cardinals hurler who’s now with the Royals. The so-called “primary repair” procedure he underwent on his elbow represents a less-invasive alternative to Tommy John surgery. The question, naturally, is how (and how long) it’ll hold up in full-speed MLB circumstances, and Maness will begin to provide some of the data needed to make that assessment. If you’re looking for some other reading material heading into the weekend, you’ll definitely want to bookmark the epic account of the 1992 expansion draft put together by MLBTR contributor Chuck Wasserstrom. Once you’re through that (it’s long, but worth it), you can check out any number of interesting pieces at Fangraphs, including these on the Orioles’ unlikely successes, the possible breakout of Aaron Altherr, and how Eric Thames turned free time into mastery of the strike zone. Those interested in reading about the bump in home runs early this year should check out this post from Ben Lindbergh of The Ringer. And if you’d like to learn the latest on the prospect front, check out Baseball America’s updated top-100 prospects list and its new top-50 draft list. The Braves have released Ryan Howard, per a club announcement. He had joined the organization recently on a minor-league deal. Howard, 37, headed to Triple-A after getting ready for the season. But he struggled through his first 42 plate appearances there, hitting just .184/.238/.263 with a single home run and 11 strikeouts. Once named the National League’s Most Valuable Player, Howard’s strikeout issues and inability to hit lefties have steadily overtaken his power over recent years. Though he swatted 25 home runs in just 362 plate appearances last year in his final campaign with the Phillies, Howard managed only a .196 batting average and .257 on-base percentage on the season. On April 26, 2010, Ryan Howard was a star. For four consecutive seasons, the Phillies first baseman had landed in the top five of the National League MVP voting and swatted over forty home runs. With the Phils in the midst of a five-year run of dominance, the sides linked up on a five-year, $125MM extension. It’s easy to mock that contract now, with the Phillies still paying down the final portion of it — a whopping $10MM buyout of a $23MM option for the 2017 season. Perhaps the organization believed at the time of the signing that the $13MM decision would be an easy one, but surely since-departed GM Ruben Amaro Jr. did not expect it would be so obvious to say goodbye to (rather than retain) the slugger. With Howard now looking to make his way back to the majors on a minor-league deal with the Braves, his huge contract is no longer weighing down the Phillies. Instead, it serves mostly as a cautionary tale. It’s easy to go overboard in criticizing the Howard contract, because we know what became of it. Though he continued to hit at an above-average rate in 2010 and 2011, while playing out the remainder of his arbitration-eligible seasons (which had been bought out under a prior extension), the actual years covered by the five-year deal were a disaster. From 2012 through 2016, Howard averaged 19 home runs annually while slashing a miserable .226/.292/.427. But that outcome surely wasn’t the expected one at the time of the signing. Howard hadn’t yet suffered a devastating Achilles injury. His K/BB numbers hadn’t eroded to the point that they would. (In fact, he had posted 15% or better walk rates in two full MLB seasons — 2006 and 2007 — and had to that point never ended a full year with less than a 10.7% walk rate.) The swing-and-miss was always there, but Howard hadn’t yet seen his chase rate jump suddenly (it topped 30% in 2010 and kept going up from there). That is to say: the Phillies weren’t wrong in assessing that Howard was a heck of a player. He was! And he gave them 64 dingers and a .265/.350/.497 batting line over the next two seasons, helping the organization to two more postseason berths. That sort of reduced-but- still-useful production might’ve continued had Howard not blown out his Achilles in making the last out of the club’s stunning 2011 NLDS exit. The Phillies did not come up with a favorable bounce on their ill-advised dice roll. That’s clear. And the deal ended up costing the organization quite a bit of money that could have been reallocated — perhaps, to other players who might’ve helped extend the contention window. (Or, perhaps to other players who might’ve been signed to unwise contracts that would have deepened the eventual financial hole.) But here, too, it’s best to avoid dramatizing the impact. When the Phillies began dismantling their once-great core, Howard’s contract meant that he’d stay on — eventually becoming the lone remaining relic. But it’d be a bit of a stretch to say that the deal impacted the team’s recent decisionmaking, or changed the timeline for a hoped-for return to contention. The delayed rebuilding launch surely wasn’t driven by this one contract. For the Phillies, the Howard contract proved to be something like the cost expended on a fancy diamond ring in a relationship that ultimately falls apart. When put in perspective, it’s hardly the thing that stings the most. And eventually, you can look back on it all with fondness despite the hard times. By the end, Howard was even able to be seen once more as a proud part of a golden era for the franchise. The Phillies organization will no doubt remember him just that way for decades to come … with the front office also constantly reminding itself of the lesson paid for in his contract. The Braves have agreed to a minor-league deal with veteran slugger Ryan Howard, according to MLB.com’s Mark Bowman (Twitter link). He’ll head to extended Spring Training before taking a minor-league assignment. Howard will earn at a palatable $750K annual rate if he makes it to the majors, Jon Heyman of Fan Rag tweets. Howard, 37, had a quiet offseason after the Phillies paid him a $10MM buyout rather than picking up their club option following the 2016 campaign. But he’s now headed to a division rival after wrapping up a 13-year run in Philly. Whether Howard will ever see the majors with Atlanta remains to be seen, of course. He’s not exactly a clear fit for a National League roster that features Freddie Freeman at first base. Perhaps, though, he’ll function as an insurance policy while burnishing his resume should another opportunity arise. It’s also possible that Howard could ultimately take a spot as a bench bat for the Braves. The market was not kind to lumbering power hitters this winter. With younger, somewhat more defensively capable players signing for far less than expected or even taking minors deals, Howard faced an uphill path to earning a MLB job. Veteran DH Billy Butler has still yet to sign. Howard certainly still has some pop left in his bat. Last year, he swatted 25 long balls in just 362 plate appearances. He also struck out 31.5% of the time and slashed just .196/.257/.453, though that was driven in part by a meager .205 batting average on balls in play. That said, Howard did make hard contact 45.9% of the time he did put bat to ball, a level he hadn’t reached since way back in 2009 — his last season as a high-quality regular. Being limited almost exclusively to facing right-handed pitching probably influenced that figure, though. Howard has long been much more successful when hitting with the platoon advantage, with more than .200 OPS points separating his career splits, and it’s hard to imagine him squaring up against southpaws much at all from this point onward. Ervin Santana of the Twins could soon become a sought-after trade target due to his talent, experience and affordability, one AL scout opines. Santana makes just $13.5MM this season and next, with a $14MM option that can vest under certain conditions. Jose Quintana attracted plenty of attention over the offseason, but Santana should emerge as a big name too if the Twins make him available — which they haven’t yet, according to Cafardo. Slugger Ryan Howard would like to continue playing, but has not yet received any opportunities, Cafardo writes. Howard did, of course, struggle through most of the past several seasons in Philadelphia, and he batted just .196 last year. He did hit 25 home runs in 362 plate appearances and bat .262/.324/.608 in the second half. It appears there aren’t any teams out there swayed by those numbers, however. Thanks to Allen Craig ($11MM) and Rusney Castillo ($10.5MM), the Red Sox’ affiliate in Pawtucket will have the largest Triple-A payroll ever. Neither are on the 40-man roster. Craig played sparingly for Pawtucket last year and hasn’t appeared in the big leagues since 2015; he’s in what should be the last year of the $31MM contract he signed with St. Louis prior to the 2013 campaign. The Red Sox will almost certainly pay him a $1M buyout on his 2018 option once the season is over. Castillo was outrighted last season and is still owed $46MM through 2020. Former star closer Jonathan Papelbon still hasn’t decided whether he’s going to keep playing, Cafardo writes. Papelbon didn’t sign this winter while dealing with a family matter. Ryan Howard tells Ken Rosenthal of FOX Sports that a productive second half in 2016 — Howard batted .262/.324/.608 in his last 140 plate appearances — convinced him that he still has “a lot left in the tank.” Howard is working out and waiting in hopes of receiving an offer for the upcoming season, Rosenthal writes. The longtime Phillies cornerstone is open to signing in the American League and serving as a designated hitter, and he’s realistic and understanding of the fact that he isn’t likely to be given an everyday role. Howard is one of many left-handed sluggers on the free-agent market — Brandon Moss, Pedro Alvarez, Adam Lind and Justin Morneau are all also available, for instance — but a strong finish and 24 home runs against right-handed pitching (in 327 plate appearances) could get him a look as a part-time DH or a bench bat in 2017. The Marlins’ acquisition of right-hander Severino Gonzalez filled the team’s 40-man roster, making further guaranteed contracts unrealistic, MLB.com’s Joe Frisaro reports. The Marlins could still add some players on minor league deals, but with a full 40-man roster and a payroll that is at its limit (roughly $110MM), additional spending is a long shot. Miami was recently connected to both Chris Carter and Mark Reynolds, but Frisaro calls the chances of signing either “extremely remote.” The Fish do have interest in Jeff Francoeur, but he’d have to be willing to sign a minor league contract in order to return to Miami. That could ultimately happen, but Francoeur does have interest elsewhere, as the Braves are said to be in on him as well. Sticking with the Marlins, Barry Jackson of the Miami Herald hears that it was the agents for Carter and Reynolds who reached out to the Marlins recently, and not vice versa. That would certainly make sense, as Miami could look like an appealing landing spot, on paper, for either slugger. Jackson writes that the Marlins are considering a 13-man pitching staff and a four-man bench, making the addition of even a modestly priced right-handed bat like Carter or Reynolds unlikely. There’s still some interest in Francoeur and Chris Johnson, he notes. Topkin also notes at the end of that column that the Rays are “possibly” considering free-agent catcher Matt Wieters in their search for a bat. While that may seem like a curious fit at first glance, offseason signee Wilson Ramos will be out early in the season as he recovers from surgery to repair a torn ACL. Even when Ramos is healthy enough to take the field, it’s all but certain that the Rays will want to be cautious at first once he’s activated. Wieters could catch regularly for a good portion of the season and eventually be part of a catcher/DH timeshare with Ramos, in theory. Newly promoted Rays general manager Erik Neander isn’t ruling out a rebuild “if the interest and market dictates,” he told Marc Topkin of the Tampa Bay Times. But, on the heels of a 68-win campaign, it seems Neander is more focused on immediately returning the Rays to relevance. “There’s a certain belief that we have in the core of our team, that it’s not out of the question that we can compete deep into the season,” Neander said. As Topkin previously reported, it’s unlikely the Rays will subtract their best starter, Chris Archer, from that core. But they continue to discuss left-hander Drew Smyly with other teams, and right-hander Alex Cobb is also a candidate to end up elsewhere via trade. Dealing one of those two would leave the Rays with a still-capable group that would also consist of Archer, Jake Odorizzi, Blake Snell and perhaps Matt Andriese. They’re mulling adding free agent starter Nathan Eovaldi to the mix, but he underwent Tommy John surgery in August and wouldn’t become a factor until 2018. In order to complement what should be a respectable 2017 starting staff, the Rays are considering outside help for their bullpen and lineup, per Topkin. Specifically, the team would like to add an adept defensive outfielder and a first base/designated hitter type to its collection of position players. With the latter need in mind, Tampa Bay has discussed such left-handed free agent hitters as Pedro Alvarez, Ryan Howard, Brandon Moss, Luis Valbuena and 2016 Ray Logan Morrison. If they opt for a right-handed batter, which could make more sense given that first baseman Brad Miller and DH Nick Franklin struggle against left-handed pitchers, 2016 National League home run co-champion Chris Carter and Billy Butler are on their radar. However, of greater intrigue than securing any of the aforementioned names is the possibility of signing Jose Bautista. While he seems like a longshot pickup for the low-payroll Rays, they could be in position to pounce on the Tampa Bay-area resident if his market doesn’t develop as hoped this offseason. Plus, because the Rays finished in the bottom 10 of the standings last season, they wouldn’t have to give up a first-round selection to sign Bautista, who rejected the Blue Jays’ qualifying offer. The Rays would instead surrender their competitive balance pick (currently No. 31 overall) in next year’s draft to ink the longtime AL East rival. Regardless of whether they’re able to reel in Bautista, it does seem the Rays are aiming to compete next year. Last season’s subpar record notwithstanding, the club has a bevy of quality players in the fold, and free agent signing Wilson Ramos should further help matters if the catcher is able to return from a torn ACL in early 2017. Former Diamondbacks general manager Dave Stewart has returned to his family-run agency – Sports Management Partners – which he’ll operate with his wife, Lonnie Murray, according to Bob Nightengale of USA Today (Twitter link). Stewart previously represented Matt Kemp and Chris Carter, among others, but he had to leave the business when the D-backs hired him in 2014. The fact that Murray remained with the agency while Stewart served as a GM led to conflict-of-interest questions, as Nick Piecoro of the Arizona Republic detailed last March. One year before he’s scheduled to hit the open market, Rays right-hander Alex Cobb has switched agencies from ACES to Beverly Hills Sports Council, tweets Marc Topkin of the Tampa Bay Times. Cobb was a high-end starter from 2013-14, but he missed all of 2015 thanks to Tommy John surgery and posted ugly results in his return last season. Over an admittedly small sample size (22 innings), the 29-year-old logged an 8.59 ERA to go with 6.55 K/9 – his lowest since 2011. It’s possible Cobb will spend his platform season in a different uniform, as the Rangers have expressed interest in acquiring him. Free agent first baseman Ryan Howard has departed CAA Sports for Excel Sports Management, reports Jon Heyman of FanRag (via Twitter). Regardless of his representation, the longtime Phillie will have difficulty securing a decent deal this offseason as part of a market laden with first base/designated hitter types, Heyman contends. Howard won the National League MVP award in 2006 and scored a five-year, $125MM extension in 2010, but his output declined significantly after he inked that deal. To the left-handed slugger’s credit, he is coming off a 25-home run season, though that accompanied a subpar .196/.257/.453 batting line in 362 plate appearances. Unsurprisingly, the Phillies bought the 37-year-old Howard out for $10MM last month instead of keeping him for $23MM in 2017. Cubs catcher Miguel Montero has left Octagon for Rep 1 Baseball, per Jerry Crasnick of ESPN (Twitter link). Next season is the last one left on the five-year, $60MM extension Montero signed with the Diamondbacks in 2012. He’s set to make $14MM in 2017 as the backup to Willson Contreras. Montero is coming off perhaps the worst offensive campaign of his career, having hit just .216/.327/.357 in 284 PAs, though his strong defensive reputation remains. Both Baseball Prospectus and StatCorner gave his pitch-framing work rave reviews. MLBTR’s Agency Database contains representation information on more than 2,500 Major League and Minor League players. If you see any errors or omissions, please let us know via email: mlbtrdatabase@gmail.com.